So for the most part, I cook Thai at home. Thankfully, while I was living in the graduate dorm in Hawaii, I had many friends from Thailand who were fellow students. They taught me several Thai dishes that I can now cook from home with some ease. One of my favorites is Thai Green Curry. It’s a very easy dish to make especially if you choose to use the prepared green curry paste that you can find in most Asian grocery stores. If you prefer to make your own paste, then the work does get harder. I personally just use a paste since it’s so convenient. Maybe one day, I will really try to make it from scratch. Currently, the green curry paste that I like best is from the brand “Dancing Chef.” This brand cannot be found here in the US though. I get them from friends and family in Singapore. But before I found this brand, I used the “Mae Ploy” brand a lot. They are one of the better brands (according to my friends) for many Thai ingredients—curry pastes, coconut milk, etc. I do want to note that cooking Thai green curry is quite different from cooking Malaysian red curry (which I’ll talk about in another post). The main difference is in how they use the coconut milk. If you’ve ever opened a can of coconut milk, you know that there is a cap of thick cream at the top of the can, and thinner milk at the bottom. In my mom’s Malaysian curry, she always adds the thickest coconut cream at the end of the cooking process. My Thai friends told me that it’s important to use the thick coconut cream first and let the oils rise to the top before adding the green curry paste. It’s almost like using the coconut as an oil to fry the paste in. 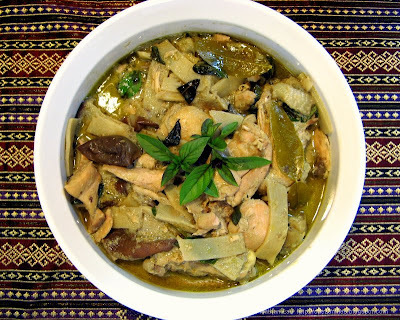 I’ve also seen different vegetables and meats added to Thai green curries. The one I make has always been with chicken but I’m sure you can vary your protein if you like. I also like to add bamboo shoots and eggplant to my curry. I’ve seen versions that use small pea-sized eggplant or the striped golf-ball sized eggplant in green or white. When I can find them, I sometimes use them. The pea-sized ones are more bitter and crunchy and I’m not as fond of them. You can also make this dish vegetarian by just adding lots of veggies and tofu. 2 Japanese/Chinese eggplant or a cup of Thai globe eggplants (Italian globes can be used if no other option is available — 1/2 will be more than enough), cut into large half moons. 1 can sliced bamboo shoots (again, the Mae Ploy or Chaokoh brands are preferable), drained and rinsed in boiling water to get rid of “tinny” flavor. Skim off thick part of coconut milk from the can (it should be on the top portion of your can—don’t shake up the can before opening). Put into your pan and heat at med high. Stir occasionally. If it looks like it’s burning, turn the heat lower. When you see a film of oil rising from the coconut, add 1 Tbsp green curry paste and stir around, mixing well. Wait for a layer of green oil to float to surface. Add chicken and stir around to coat. Cook chicken till it’s almost done. You should again be able to see that layer of oil on top. Add the rest of the coconut milk and a couple of dashes of fish sauce (maybe about 1 tsp). Let it come to a boil and turn heat down. Add in bamboo shoots and eggplant and Thai lime leaf (if using). Cook until eggplant is translucent and cooked through. Switch off the heat and stir in Thai basil leaves (leaving some to garnish if you want). Taste and add more fishsauce and/or sugar if needed. Serve this dish with jasmine white rice and you have an instant meal. It tastes even better the next day so hope for leftovers! This post was entered into the Weekend Herb Blogging roundup hosted by Canela & Comino and created by Kalyn of Kalyn’s Kitchen. >I love thai food – and always have tubs of mae ploy pastes in the fridge in case of emergency! I like to add brocolli for the last couple of minutes of cooking, so it stays pretty crunchy… the florets sook up lots of gravy! Maybe not authentic, but very tasty! >I love Thai food. This recipe looks so delicious and farely simple. Can’t wait to try it. >yummy. I love Thai green curries. I tend to use the Thai Kitchen brand for the paste, but I was never really satisfied with the taste. Perhaps I will try one of the brands found in the Asian markets. >I love Thai food, but I don’t often eat curries. Looks great! >There are so many packaged curries that I’m hesitant picking one because I’m afraid I might choose the not-so-good one. Thanks for the tip! 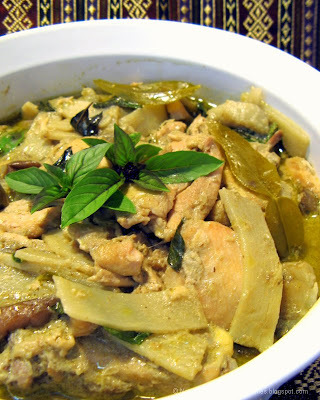 >I love green curry — I do use the Mae Ploy brand, which is available at my local Asian market. Great tip to add the thick part of the coconut milk before the more watery part — thanks. >Yum! I use Mae Ploy Brand too-in fact, I find the paste really strong. I have a tub of red curry paste in the fridge and it’s still going after 3 rounds of curries. More importantly, it tastes good too! >I use the tubs of Mae Ploy paste, too, which are a lifesaver. Now you’ve inspired to me to try their green curry paste — So far, I’ve enjoyed their panang and red curry versions. I used to think that making Thai curry was a complicated process until a Thai neighbor gave me her own recipe and I was amazed at how simple it was. I don’t make a very “authentic” version, though, because I throw in whatever meats and veggies I have handy. It’s still delicious and, yes, the leftovers are even better. >This curry looks, well, just amazing. It looks like the one I get at my favorite Thai restaurant. I am so glad you shared this recioe. >@Kitty – if we add broccoli, it’s usually cooked soft. The bamboo shoot adds to the crunch. 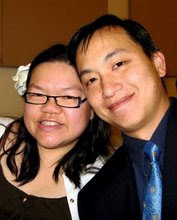 @Pam – it is simple enough for anyone to make, so don’t wait too long! @Judyfoodie – gotta venture out to the Asian markets to find Mae Ploy. Don’t think they carry them in Safeway. @Esi – Thai curry is different from Indian curry. It’s a different kind of spice. Try it, you’ll like it! @JS – You’re welcome. I’m sure you’ll be able to find Mae Ploy brand there. >@Lydia – yeah, who knew that you weren’t supposed to mix the cream back into the milk before using it? @Daphne – we have a recipe for fishballs using the red curry paste. Stay tuned! 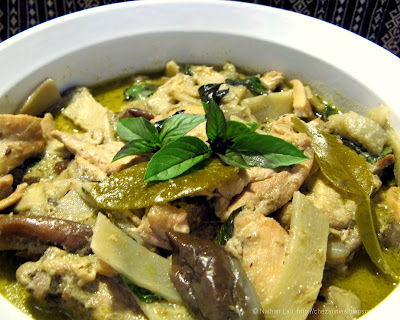 @Jenster – Green curry is so easy! The fun part is making it how you like it. @Manger La Ville – thank you for your compliment, and thank you for visiting our site! >I’m dying to try the new Jasmine restaurant that will open in the Franklin Mall in Santa Clara. It’s not open yet, but this Thai restaurant looks really elegant and stylish. The furnishings and artwork are in place, so I’m hoping it will open any day now. >It definitely does sound delicious! I love Thai curries. I’ll have to watch for that brand of coconut milk. In Utah at both my favorite Thai restaurants you can ask for “authentic” Thai and they will leave out the extra sugar, which they tell me is added to suit American tastes. >@Kalyn – ah, you know not to take it with extra sugar too, eh? >Yes, I agree Thai foods served in US-based restaurants are generally much sweeter than the same dishes served in the motherland (and even those have become much sweeter than what they used to be). Have you tried Coriander? I heard it’s pretty good. SWIFT Theme by Satish Gandham. 55 queries in 0.951 seconds.